Adapted from Creative Commons Share. I’m always inspired by people speaking with prescience about their future–which could be our present. While the terms and situations are not always identical, I do think there’s something important about this conversation. Facebook friend of the blog Zach posted a video of an interview with Bishop G. Bromley Oxnam, who was a fellow Boston University School of Theology graduate (there’s a room named after him there, in fact) and was responsible for the relocation of what is now Wesley Theological Seminary in Washington D.C. There is value in positive thinking. There’s value, I suppose, in any faith that enables a man to move out in strength toward the future. But I think there is danger here that we may identify Christianity with the cult of success. And assume that because a man is a Christian therefore he must be successful in monetary terms or in terms of the occupation he happens to hold. There seems to be an assumption that if you just think positively, you are going to be President of the company tomorrow morning. But there aren’t enough openings along that line. These comments directly correspond to the rise of Health and Wealth theology, which is the tradition that Prosperity Gospel and Prosperity-Lite Gospel preachers like Joel Osteen. How does Bishop Oxnam articulate the difference between the Gospel and the power of Positive Thinking? We mustn’t forget the fact that Christianity is a religion grounded in love that at its heart is the symbol of the Cross. We move out in terms of sacrifice, that people are transformed as we spend our lives for others. While that isn’t denied in positive thinking, there’s a certain emphasis here that I think needs to be watched very, very carefully. Well said, 65 years ago. I would suggest watching the whole clip…there’s a lot to like in the variety of topics, and a lot to shake your head about (his assumption that all churches would become unified under the NCC is sadly misplaced). – I think we’ve abandoned that too. Great video. I often wonder if we as Christians missed the mark in the 50’s. One small correction: Bishop Oxnam’s first initial was actually G. His first name was Garfield. The video title references him as “A. Bromley” but you are correct. Edited and corrected above! I don’t think that Bishop Oxnam was really saying that all churches would be unified under NCC, but rather we should be able to come together. I think by that he meant acknowledging what we have in common, and building relationships on that instead of fighting over each denominations traditions and practices. I very much like what he had to say about positive thinking and prosperity gospel. Whereas I do think that positive thinking is good for a person, making that part of Christianity rather dilutes it, makes it just a self improvement tool. And now I know why Wesley Seminary has the Oxnam Chapel. I’m glad to see this great theologian is still commemorated by the UMC and in one of the top UMC seminaries in the US, no less. Thoughtful, articulate, passionate… and able to speak with some authority not simply for The Methodist Church but for Protestants generally because of his deep ecumenical commitments and relationships. I can only admire Bishop Bromley’s witness, even where I may disagree with some of his positions. 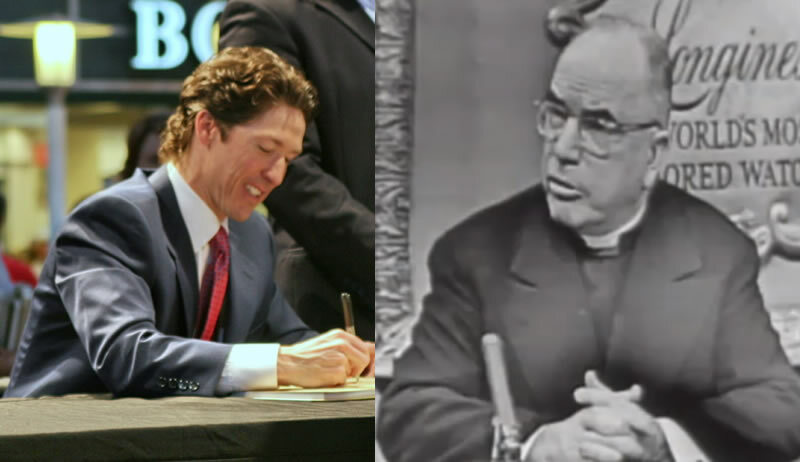 Norman Vincent Peale –whom I used to talk about the way you, Jeremy, talk about Osteen– would have been in his hay-day at the time of this interview. While Joel Olstein is undeniably a heretic, invoking a known Communist, a Soviet sympathizer who was one of the key forces behind the devastation wreaked on the Methodist Episcopal Church, against him, is a bit reminiscent of Tertullian’s furious polemics against the Valentinians. In this case, its a bit like asking an ancient, ruined bronze age pot to call a modern-day kettle black, from beyond the grave, so to speak. In a sense, Olstein represents one half of the evil, neo-Gnostic movement that is destroying American protestantism with the false “Prosperity Gospel”, and Oxnam represents the other, the wicked, unscrupulous, iconoclastic element, led by heretics such as James Pike, who based their theology on the depraved ideas of the Modernist movement, the Renovationist schismatics in the Russian Orthodox church, and so forth. By the way, if Jeremy Smith really wanted to score an effective point against Olsteen, he could quote John Chrrysostom at him, rather than some far left irrelevant Methodist heretic bishop, that is not commemorated by any in the church, aside from a few far left clerygmen.